COMPLETED FOR FIRST SUBMISSION: The Plan sets out the vision, objectives and policies, with other sections to provide a context for those items. This step covers all stages of writing the Plan up to its first formal submission (known as Regulation 14 or "pre-submission"). It also includes preparation of the Evidence Base, and a Heritage Asset Register. COMPLETED FOR FIRST SUBMISSION: The Plan's policies must be justified and for convenience this has been done in 13 separate volumes of evidence for the Plan. These document also includes explanation of the policies, and the way in which they are intended to be implemented. COMPLETED FOR FIRST SUBMISSION: Since the Plan has little or no adverse environmental impact, it is unlikely, though still possible, that a full environmental impact assessment or habitats regulation assessment will be required (that will finally be confirmed when Breckland Council commissions a screening study on the subject, in parallel with the Regulation 14 submission). But a Plan must demonstrate it is sustainable (something that underpins planning regulations) and to do this a Sustainability Statement has been prepared. In simple terms this is a matrix showing whether the Plan's policies meet Breckland Council's strategic sustainability objectives. You can find it in Evidence volume 13. One of the Plan's policies aims to safeguard historic features around the Parish from development pressures. These comprise listed and non-listed buildings, sites of archaeological or historical interest and places where items of interest have been found in the past. Rather than list all of these in the Plan, they are listed in a separate document, known as the Heritage Asset Register. COMPLETED: This was a voluntary but useful step to get some views on the draft document from Breckland's planning specialists, including their Neighbourhood Planning Coordinator. Two versions of the Plan were submitted informally, the first in February 2017 and then again in July 2017 after it was rewritten based on the first set of comments. We also made a presentation to them of the updated policies in late January 2018, to prepare them for the Regulation 14 submission. (iv) the deadline for receipt of representations (minimum 6 week period). 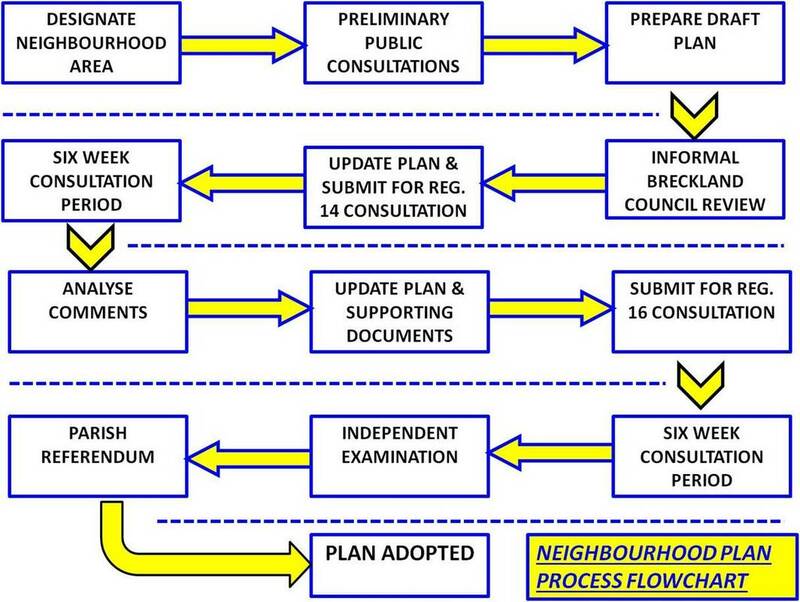 (c) send a copy of proposals for the Neighbourhood Plan to the local planning authority. COMPLETED 29th APRIL 2018: Anyone who lives, works or runs a business in the Parish is entitled to comment on the Plan. It is also sent to a wide range of bodies, known as statutory consultees, to neighbouring Parish Councils, and to organisations such as Historic England, Natural England and the Environment Agency. During the six week period a series of events will be held to help parishioners understand the Plan better. Every comment received must be considered, although there is no obligation to include every one of them in the Plan. What is necessary is to show how each was considered and what was done about it. The Plan is then updated again to incorporate the relevant comments. Evidence of how all comments were dealt with must be included in a separate document called the Consultation Statement. At this stage another separate document, called a Basic Conditions Statement, must also be prepared that shows how the Plan meets all the legal and regulatory requirements. When all the documents are updated the Parish Council submits them to Breckland Council in accordance with Regulation 16 of The Neighbourhood Planning Regulations. Breckland then need to publicise that the documents are available for a second six week public consultation. At this point Breckland Council takes control of the Plan and the Parish Council are not allowed to make further changes without their agreement. Although it's open to all the same people, this consultation period differs from the first in that comments can only be about any points where the Plan and other documents do not comply with regulatory requirements. Breckland Council then selects three possible independent examiners and the Parish Council chooses one of those. Breckland Council must send to that examiner the Plan and its associated documents together with all comments received during the Regulation 16 consultation. No assessment of the comments is required by either Council. The examiner studies all of the documents and the comments and writes a report giving his assessment. Examination is limited to assessment of regulatory compliance; the examiner's opinions on any other matters are not relevant. The report is sent to Breckland Council (with a copy to the Parish Council) and gives recommendations for any changes and whether a referendum is justified. Examination usually takes 2-3 months. Once submitted for examination the Plan can then be taken into account when decisions are made on planning applications. Breckland Council has the right to ignore any examiner comments it disagrees with and is not required to consult the Parish Council on that. It must carry out its own review of regulatory compliance and then publish a decision as to whether the Plan can be voted on in a Parish referendum. If the examiner recommends it and Breckland Council agree, the Council must then organises a referendum to vote on whether the Plan should be accepted. All eligible voters in Saham Toney may take part. Regardless of turnout if more than 50% vote "yes" Breckland Council must formally accept the Plan as part of its development planning process. Breckland Council then formally accepts the Plan and publishes that decision. This acceptance is known as the Plan being "made".